Truth be told, if you really want to stop window condensation, you first need to understand why it happens. Let’s start with an example most can related to. Imagine sitting outside on a warm summer day with a glass of ice-cold lemonade at your side. The outside of that glass will be wet with condensation. Why? Because warm air holds more moisture than cold air, and as the warm summer air that strikes that cold glass and gets chilled, it releases the moisture it held and voilà – you’ve got condensation! This same thing happens inside a home when conditions are right. If water forms on the inside of windows, there’s likely a combination of causes allowing that to happen. These include high humidity, poor insulation and a lack of good mechanical and passive ventilation. They all combine to let moisture form and rise up through the home causing a wide variety of potentially unhealthy and unpleasant conditions from water damage, to mold and more. Building science tells us that this movement of moist air is part of the “stack effect” where warmer air enters a structure from the lower floors, often though a crawlspace or basement, and then rises up through the building – cooling as it goes – and releasing much of that moisture along the way. It’s a powerful force, but one that can be overcome with steps to reduce moisture at all its sources. Given that we can’t fight physics, the best way to stop condensation from forming on the inside of windows is to reduce the humidity that allows that moisture to form in the first place. That includes addressing the most common ways excess moisture gets in to the home, improving windows to be able to reduce the temperature differential between outside and inside, and improving the ventilation needed to move the moisture out. Some of these steps are simple, some take more time, expense and planning. But all will help reduce or completely eliminate moisture from forming inside your windows and can be accomplished individually or all at once. Whether you have a home on a basement, crawlspace or slab, chances are you are letting too much moisture collect too close to your foundation. Gutters often become clogged, downspouts rarely extend far enough away from a home and soil often settles around the foundation. These conditions allow rain water to take aim at your concrete or block foundation which is perfectly suited to absorb that moisture and discharge it as humidity that evaporates from the foundation into the house, or even as a full-fledged basement or crawlspace flood! 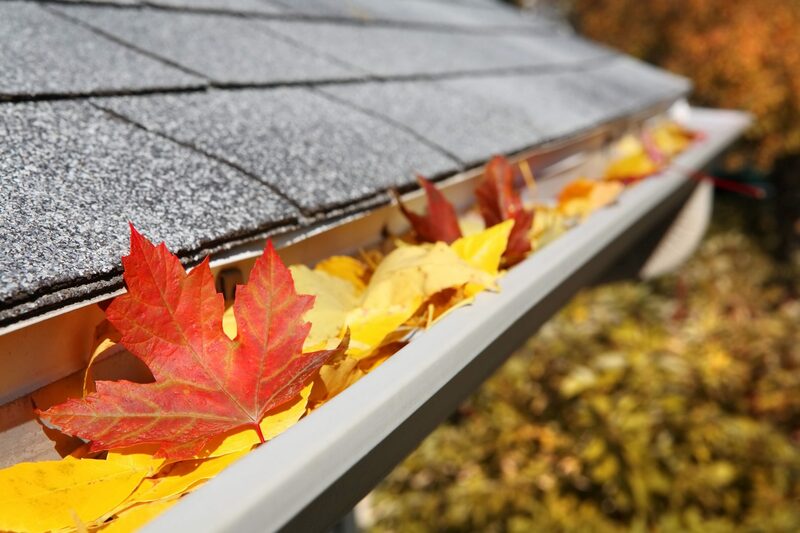 To stop the flow, clean your gutters, extend spouts at least 4 to 6 feet away and make sure the grading around your home slopes AWAY from the foundation. For all the details, read our post about stopping wet basements as the very same advice applies. For crawlspaces, and especially those with dirt floors, it’s also important to install a vapor barrier (thick plastic sheet, with as few seams as possible) across the entire crawlspace floor and assure that the crawlspace vents are left open in all but the very coldest months. The foundation of a healthy home is a healthy basement, as basements are one of the biggest contributors to indoor air pollution and high humidity. One product perfectly suited to address both is EZ Breathe. 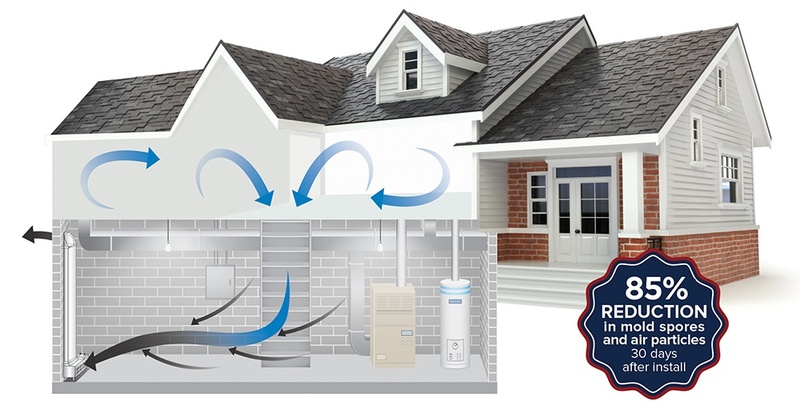 EZ Breathe is a ventilation system that takes moisture out of the air and improves indoor air quality by helping remove odors, allergens, chemicals, mold spores, dander, soil gases, all manners of indoor air pollutants. It works by exhausting the stale air from below grade spaces as well as the contaminants and moisture that come with it, and replaces it with fresh air, thereby creating a healthier, less humid atmosphere. With humidity being reduced at the source, it’s much less likely to be available to form on windows, walls and other areas inside the home. In fact, some EZ Breathe customers have reported basements feeling dryer and warmer, as well as completely eliminating window condensation. Another common source of moisture inside the home is that which we create from cooking and bathing. In both cases, it’s important that exhaust fans be vented outside. Kitchen vent hoods that don’t exhaust and simply recirculate do nothing to reduce moisture. Bath exhaust fans also need to be vented outside, and not into attics or other crawlspaces. Plus, since humidity hangs around long after bathing is complete, bath exhaust fans should be on timers or humidistats that allow them to run long enough to completely eliminate the moisture before shutting off. As an added benefit, reducing bathroom humidity also means that mold won’t be able to form nearly as easily, and you’ll be doing a lot less cleaning! Many homeowners tend to think of the home as being built in sections that are sealed off from each other. But while a roof can keep out the rain and insulation can prevent heat loss, moisture on the other hand, has the uncanny ability to flow freely from the basement to the living space an on up into the attic. That’s why good attic ventilation is an important part of the managing moisture that might otherwise show up as window condensation. Aside from the negative effects of condensation, moisture that condenses in attics can rot out roof sheathing and render insulation ineffective. In fact, if you are wondering if your attic has excessive moisture, here’s a home inspector’s trick of the trade; Next time you are up there, look at the tips of roof shingle nails that stick through the sheathing. If you see rust on those nail tips – you’ve got moisture that’s not being ventilated! To correct poor attic ventilation, I recommend continuous soffit and ridge vents. Air will enter the attic at the ridge, run up under the roof sheathing when it carts heat away in summer and moisture away in winter, and exit at the ridge. This 24/7 ventilation solution is far more effective than any other type of mechanical or passive attic ventilation solution. I saved this point for last because it’s costly and as explained above, there’s a lot you can do short of window replacement to reduce or eliminate condensation inside windows. However, truth be told, the worst windows condensation problems are caused by poorly insulated window glass. Windows that are single pane, many older metal windows or those that are thermal pane where the insulating seal has been lost (these often also appear as foggy) are ripe for a condensation issue. As we discussed earlier, just like condensation forms on a glass of ice-cold lemonade during a hot summer day, warm moist air that strikes a cold window surface will release that same moisture and turn into a drippy, leaky mold-forming mess in your home. By replacing inefficient, drafty and cold windows with new Energy Star rated units, you’ll find that condensation will be a rare occurrence, especially if you also tackle some of the steps outlined above. To reduce costs, consider replacing windows on the colder north side of your home first, followed by the east, west and south. 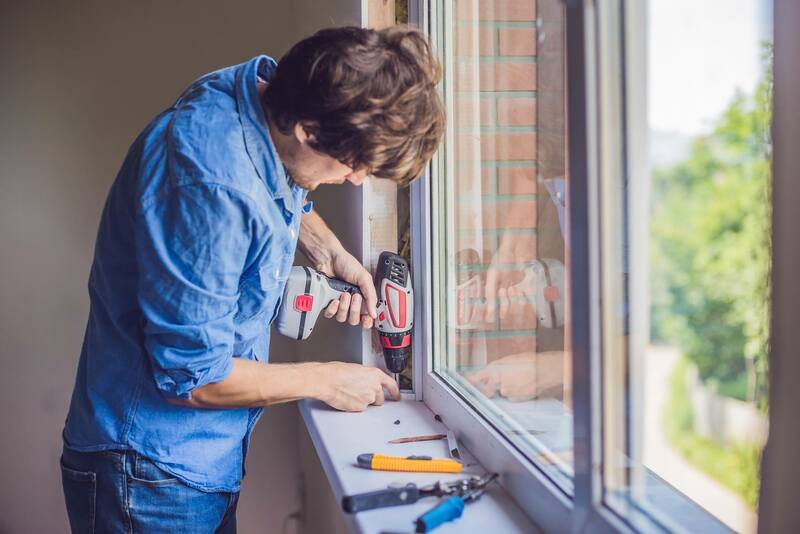 By spreading the job over multiple seasons, you’ll be replacing those windows must likely to form condensation first, and then completing the job in year 2, 3 or even 4. Stopping condensation inside windows is far easier to do if you understand the basic causes and cures. By reducing moisture at its source, adding mechanical ventilation like EZ Breathe, as well as improved bath, kitchen and attic ventilation, and by replacing old, outdated windows, you’ll be able to enjoy a dry, healthy and comfortable indoor environment. The post How to Stop Condensation Inside Windows appeared first on The Money Pit.